October 2016 – Page 2 – Welcome to Wyandotte Daily! The Board of Public Utilities will meet at 6 p.m. Wednesday, Nov. 2, at the BPU offices, 540 Minnesota Ave., Kansas City, Kan.
On the agenda for the 6 p.m. Nov. 2 meeting are the AMWA platinum award presentation, third quarter financial report, board comments, general manager comments and a closed executive session. The executive session will discuss a confidential matter that could be a personnel, legal or property matter. There will be a BPU work session at 4:30 p.m. Nov. 2. On the BPU work session agenda are a board update and general manager update; UG Commissioner Mike Kane’s comments; Kansas Open Meetings Act presentation by Ken Moore, UG attorney; a revenue forecast, and customer service policies. Both meetings are open to the public. Kansas City Kansas has another national basketball champion. A well-known basketball referee and baseball and softball umpire and longtime administrator at Kansas City Kansas Community College, Duane Shaw won the most coveted of gold medals in the recent senior world games in St. George, Utah – the overall free throw shooting championship sponsored by the National Basketball Shooters Association (NBSA). At age 78, Shaw is the oldest to ever win the overall championship. In addition, he was a double gold medal winner in his age group in the Huntsman World Senior Games – placing first in Hot Shot and Free Throw/3-Point competitions that drew 140 competitors from all over the nation. The championship comes on the heels of KCKCC’s winning the NJCAA Division II women’s national basketball championship. Shaw qualified for the 16-man overall championship by making 24 of 25 free throws, then made 100 of 102 in outdueling four of the best free throwers in the world. He started with 25 straight in ousting a shooter from California. “He missed four or five and gave up,” Shaw said. “He got pretty mad and wouldn’t shake my hand. He took no chances from there on, making 50 in a row in eliminating Skip Hills of Ottumwa, Iowa, and 60-year-old Tim Atwater of Washington state. A competitor in every World Senior Games except one since 2002, it was the first time Shaw had reached the NBSA finals. “I’d been in the final 16 the last five or six years and got to the final four once,” Shaw said. His only regret was that his late wife, Ola, was not on hand. She died March 26 after attending every other world games. However, the Shaw’s son, Danny, was on hand for the first time. “He gave me the biggest hug,” beamed Shaw, who received a ring for the championship along with the gold medal. While the overall championship was Shaw’s first, it was by no means his first in the World Senior Games. Competing in his age group, Shaw owns five golds, two silvers and four bronze in free throw shooting and five gold, two silver and two bronze in Hot Shot – a competition in which points are awarded for shots from six different positions and distances over a span of 60 seconds. 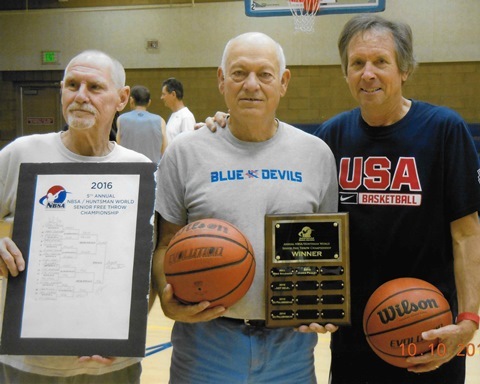 Prior to the World Games in St. George, Shaw took part in senior games in Las Vegas, winning gold in his age group in free throws and Hot Shot and silver in 3-point. After the age group finals, the top eight shooters of all the age groups advanced to all-around championships in free throw and 3-point. “I got beat unmercifully in the final four of the 3-point but got to the finals of the free throws where I had to play James Pauley, one of the very best in the nation and the defending NBSA overall champion,” Shaw said. “We got to about the 18th or 19th shot and neither of us had missed and he missed. All I needed was to make my last six and I missed my next shot and then he beat me on about the 27th or 28th shot.” However, the silver was worth $200. That he’s so successful is by no means happenstance. He usually shoots at least 100 free throws a day, many at his home where he has an enclosed basketball hoop. Despite surgery on his shoulder this summer, Shaw made 15,943 of 16,420 attempts – a 97.1 percent success rate. Overall since he started documenting his shots, he’s attempted 102,820 free throws, making 99,918 for 97.2 percent. “Everyone documents their shots and I tell people that you have to shoot every shot like it was the last one of the game and you have to make it,” Shaw said. This year, Shaw competed in 24 basketball events in nine senior games, taking home 21 golds and three silvers and making 404 of 417 free throws (96.9 percent). A native of Pomona, Kan., near Ottawa, Shaw was an outstanding football and basketball athlete at Pomona Rural High School (now West Franklin County) and holds Pomona basketball records for points in a game (42) and season (409), enough that he was a member of the freshman team at Kansas State in 1956-57. A high school and college basketball referee for 30 years and a baseball and softball umpire for 41 years, Shaw umpired Kansas City Royals games during the strike season of 1979. An education major at K-State, Shaw began his career in KCK at Central Junior High School. For 15 years he was director of student activities at KCKCC and another 12 years as athletic director. Retired as athletic director in 1998, he was inducted into the KCKCC Athletics Hall of Fame in 2014. Once retired, he has competed in Senior Olympics in a dozen states and while basketball has been his main forte, he’s also competed in bowling, horseshoe pitching, track, shuffleboard, darts, bocce ball and skills events in football, soccer, Frisbee and softball. In all, he’s won 612 gold medals, 266 silvers, 202 bronze and 36 other awards. Several safe trick-or-treat events are planned tonight in Kansas City, Kan.
Several other events have already been held in days leading up to Halloween at local churches, neighborhood centers and libraries. There will not be trick-or-treating at The Legends Outlets stores this year. However, the Yard House at The Legends has posted on social media that it will be giving out a certificate for a free kids’ meal to children who go there tonight dressed in a Halloween costume. Safe Halloween events tonight are at Eisenhower Recreation Center, Bethany, JFK, Armourdale, Argentine, Kensington recreation centers and at Alcott Arts Center. Lou Braswell, executive director of the Leavenworth Road Association, said the LRA and the Wyandotte County Parks Department are sponsoring a safe Halloween event from 5 p.m. to 8:30 p.m. on Monday, Oct. 31, at Eisenhower Recreation Center, 2901 N. 72nd St., Kansas City, Kan. Planned at Eisenhower are treats, games, hot dogs and activities. Several volunteers are participating. Some staff from the West Wyandotte Library will be helping the Eisenhower Recreation Center Halloween party by providing games, Braswell said. Children may trick-or-treat by going from table to table at the recreation center. Halloween-themed events already were held last week at the Kansas City, Kan., Public Libraries and none is scheduled today. The hours of the recreation center trick-or-treat events are from 6 to 8 p.m.
A trick-or-treat event also is scheduled from 5:30 to 8 p.m. tonight at Alcott Arts Center, 180 S. 18th St., Kansas City, Kan. Children may trick-or-treat at this event. Chris Green, executive director of the Alcott Arts Center, said many volunteers are participating in this event. Students are coming from Washington, Schlagle, Wyandotte and Turner high schools to help, she said. She asked that no one older than 18 years old trick-or-treat. There will be some entertainment at the Alcott event, she said, with face painting by Sheryl Nance Durst from the public library, and Deryl Woods doing poster art. The Alcott is not handicapped-accessible. The events tonight are free and open to the public.